Floor Details will provide the solution you are looking for. We understand the concerns and issues professionals and maintenance personnel face each day such as; floors not staying clean, sticky floors, ugly dark grout, slippery floors, slow cleaning production rates, along with stains and grime that won't come clean, and even employee and customer headaches caused by chemical odors. Floor Details is the only solution for all of these problems. 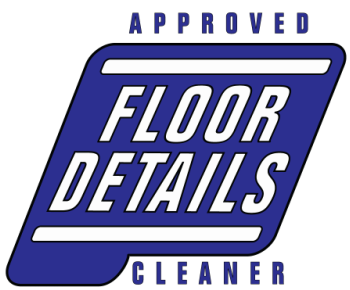 Floor Details was developed by our chemists with the primary goal to create a professional cleaner that would be detergent free, yet be more effective than any other cleaner available, while being safe for people, pets, and floors. Floor Details was created utilizing the power, convenience, and proven effectiveness of encapsulation, and a proprietary blend of USDA approved minerals derived from specific mines, with each ingredient being processed and stored to our specifications before shipping to our facilities for mixing. We have created the most effective cleaning solution available. Floor cleaners either use (or combine) surfactants, high and low pH values, heat, detergents, un-natural polymers, foamy surfactants, and/or harsh chemicals to release the dirt and stains from the floor. Floor Details does this without any of these factors. Developed as a single cleaning solution that would naturally release anything not originally on the floor from the manufacturer, Floor Details makes cleaning easier, healthier, faster, and better. The added benefit of encapsulation in Floor Details assures that it keeps cleaning, without needing to be rinsed or 100% extracted. Perfect for single step mopping. After 20 years with outstanding results by professionals and in use by large facilities and restaurants, it is the exclusively recommended cleaner of hundreds of flooring retailers, and is now offered to all cleaning professionals and facility maintenance personnel. Here are the main reasons restaurants, convenience stores, assisted living centers, and many other commercial and industrial facilities choose Floor Details. Use it on quarry tile, concrete, and many other floor surfaces.